Chuh Kaw Go, What Do You Really Sound Like? 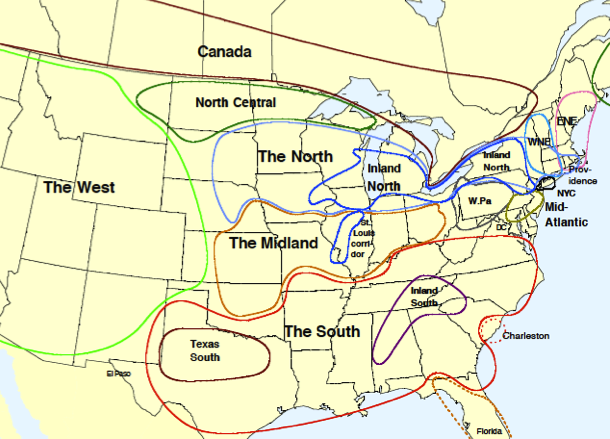 The Inland North, as defined in the Atlas of North American English. The Northern Cities Shift, as mapped by Labov and his team. The left side of the diagram corresponds to the front of the mouth. Like a lot of Chicagoans, Sarahlynn Pablo grew up thinking she didn’t have an accent, so when friends at her Pittsburgh college suggested that there was something particularly Midwest about her pronunciation, she wrote them off. It wasn’t until the Des Plaines native heard a recording of her own voice as an adult that she started thinking her friends might’ve had a point. “It just kind of creeped me out. I didn’t know I sounded like that,” she says. And how, exactly, does she sound to herself? Where does our unmistakable and lovable Chicago accent come from? Oh, we’ll get there. But first — just what the heck is it? Come again? Are you saying “mom” or “mahm”? An “accent” encompasses everything from pronunciation to grammar to vocabulary. But most Chicagoans know they say “pop” instead of “soda,” and it doesn’t necessarily creep them out. Ask Sarahlynn what does and she’ll tell you it’s the way she pronounces “mom” like “mahm.” So putting aside questions of grammar and vocabulary, I went straight to the Chicago accent authorities: Bill Swerski and his Superfans. As Chicago accent ambassadors go, you could do a lot worse than the Superfans, at least according to Corrine McCarthy, an Orland Park native who happens to be a linguist at George Mason University in Virginia. (And, in my humble opinion, she has a prominent Chicago accent.) She’s been researching Chicago pronunciation since 2007 and says the Superfans’ accents are pretty accurate, if exaggerated. Many Chicagoans do substitute a “d” for other English speakers’ “th,” as in “da Bears” and “da Bulls.” But these “des, dem, does” consonants aren’t actually unique to Chicago; they’re found in dialects across the United States. Instead, what really marks the Superfans are their vowels. When it comes to American dialects, McCarthy says, “vowels are pretty much what separate us.” By this measure, Chicagoans are even more separate than most. Windy City residents have some of the most non-standard vowel pronunciations in the country. McCarthy says Chicagoans also tend to transform words like “but” and “cut” into “bought” and “caught.” And the vowel shifting doesn’t end there. Linguists have identified up to six vowels Chicagoans are pronouncing in non-standard ways. But those vowels in BAT, BOT, and BUT are, McCarthy says, the big three. How far beyond the Superfans? It’s called the Chicago accent, but not everyone born in Chicago has it. Chicago is actually home to two – maybe even three – major dialects: “Chicago” English, African American English, and (possibly) an emerging Latino dialect. Take a look around Ditka’s bar — the Superfans’ favorite haunt — and you might expect the Chicago accent to be a property of white, lower and middle-class men, prone to sausage-eating, heart attacks, and Monday morning quarterbacking. The white part is mostly right. McCarthy says most speakers of the Chicago accent are of European descent, but she says the idea that the Chicago accent is a class thing, a sports fan thing, or even a guy thing is misleading. In a 2010 study of the Chicago accent, McCarthy found that women actually raised their BAT vowels more than men. And when it comes to education, having a college degree seemed to have no significant effect on the speaker’s vowels. As for why Black and Latino Chicagoans’ vowels tend not to resemble their white counterparts’, consider Leonard Bloomfield’s “Principle of Density.” Bloomfield was a prominent University of Chicago linguist in the 1930s and ‘40s, and he made what seems like a pretty common-sense observation: People who communicate with each other early and often will start to sound like each other, and those who don’t, won’t. According to Richard Cameron, head of UIC’s linguistics department, the application of Bloomfield’s density theory in Chicago is clear — the city’s segregation all but guaranteed white and black Chicagoans wouldn’t speak alike for a very long time. Sure enough, most African-Americans in Chicago today speak what linguists call African-American English (or AAE). AAE is remarkable for being consistent across urban areas; that is, Boston AAE sounds like New York AAE sounds like L.A. AAE, etc. So while an African-American Chicagoan might not sound like a white Chicagoan, he or she may sound a whole lot like an African-American Washingtonian. What about Latino Chicagoans? I asked Richard Cameron, the head of UIC’s linguistics department and an expert on Spanish, about this. Now that twenty-nine percent of Chicago’s population is of Latino descent, he’s willing to bet there’s an emerging Latino English dialect developing in Chicago too, and its effect might be felt by non-Spanish speakers. He says this is even more likely in neighborhoods where Latinos outnumber other ethnicities. What might this Latino English sound like? Cameron isn’t ready to say until the kinds of studies that have already been done in places like Los Angeles are conducted here, too. But, he says, with the number of Latino Chicagoans on the rise, you can wager linguists won’t be in the dark about Chicago’s Latino dialect for long. And just as there are Chicagoans who don’t have the Chicago accent, there are non-Chicagoans who do. A lot of them, actually. And, it so happens this has to do with a dirty little secret about the “Chicago” accent: It’s not unique at all. People are raising their “a” vowels and saying “hat” instead of “hot” in cities such as Detroit, Milwaukee, Madison, Cleveland, Syracuse, Rochester, and Buffalo – all parts of a dialect region that linguists call the “Inland North.” (In yet another blow to civic pride, the “Chicago” accent is actually more properly called the “Inland North dialect.”) We’ll get into the reasons why the “Chicago” accent is so widespread in a minute. First there’s Sarahlynn’s question to tackle. Where does the Chicago accent come from? In Chicago, that probably makes the Yankees the winners (sorry Sox fans). Here’s a likely scenario: New England Yankees first migrated to Chicago in the mid-1800s, to take advantage of the city’s potential as a transportation hub. They brought their accents with them and when their speech became the local standard, most later migrant groups got with the program. If you’re not convinced, consider this: Linguists say Chicagoans today sound a lot more like people from Buffalo, Syracuse, and Rochester than they do people from Dayton, Indianapolis, or Pittsburgh — despite the fact that every one of those latter cities is closer to Chicago. Why is this? Samples from the Speech Accent Archive at George Mason University. Well, what Chicago and those eastern cities have in common isn’t geography — it’s history. University of Pennsylvania linguist William Labov was the first to define the Inland North dialect in the 1970s, and he’s since hypothesized it all started with the construction of the Erie Canal, a project that brought thousands of laborers westward along the Great Lakes from New England. Sure enough, Rochester, Syracuse, and Buffalo all lie along the Erie Canal. Dayton, Indianapolis, and Pittsburgh don’t. If this origin story seems to give those early settlers an awful lot of credit, it does. But consider your own family history and, like Corrine McCarthy, you’ll probably find an example of the power of the pre-existing local dialect. Corrine’s great grandparents were Polish immigrants, but her grandmother, a native Chicagoan, spoke without a Polish accent. More than any other age group, children are adept at acquiring new accents and, as in most things, they’re more likely to take after their friends in the way they speak than mom and dad. The result is that unless an immigrant group is ghettoized over many generations, it will start to conform to local linguistic standards within a few generations. Corrine’s grandmother may have grown up hearing Polish at home, but when she got to school, chances are she elongated her “a” vowel along with everyone else. If the first dialect “wins,” then we have a problem when it comes to answering Sarahlynn’s question: We don’t know what those early Yankee settlers sounded like. “To know exactly how the accent evolved,” McCarthy says, “we’d have to have some pretty old recordings of when Chicago was settled and how it changed from the time when it was settled to today.” The oldest recordings she has are of people born in 1890. But we do know one very important thing about Chicago’s linguistic ancestors: Their vowels wanted to move. Experts I talked to say, in a very real sense, the answer to Sarahlynn’s question lies with the English language itself. English has a lot of vowels, and as Richard Cameron explains, the way we form vowel sounds in our mouths is imprecise. To produce the “e” sound in “feet,” for example, I move my tongue towards a certain location in my mouth (the upper front area, if you’re wondering). The more vowels a language has, the more vowel locations jostle for space inside our mouths. So as you can imagine, when we speak English, those vowel locations get pretty crowded and they may even overlap, causing vowels to run together and upping the chances that communication breaks down. There are a few ways of dealing with English’s uncomfortable vowel situation. One is to get rid of a vowel. Recently something called the “COT – CAUGHT merger” has taken North America by storm. Wearied of distinguishing between so many vowels, many Americans have taken to pronouncing words like “cot” and “caught” the same way. (Chicagoans, for the record, don’t do this). Another approach involves pushing an existing vowel to a new, extreme position in the mouth, thereby creating more space for the other vowels to breathe. This is what Inland Northerners have done. You could say the Chicago accent began the first time someone pushed their BAT vowel to the extreme high, front part of their mouth. This is how BAT became b-ea-t, but it didn’t end there. Once BAT moved out of the way, the remaining vowels spread out in a seismic reshuffling that linguists call a “chain shift.” Imagine a crowded el car, where people are packed like sardines. If one person exits, all the remaining passengers will spread out to take advantage of the extra room. Same thing with the linguistic “chain shift.” In the case of the Chicago accent, the BAT moved, so now the BOT vowel moves to occupy the space that BAT once occupied (“hot” becomes “hat”). Then, the “aw” vowel in a word like “stalk” moves to fill the space vacated by BOT’s short “o” (“stalk” is now pronounced like “stock”). BUT moves into BOUGHT’s spot, and so on. Up to six vowels sounds are ultimately involved in this movement, which its discoverer, William Labov, named the Northern Cities Shift. All three characteristics of the Chicago accent described earlier (the raising of the “a” vowel in BAT, the fronting of the short “o,” the backing of “but” until it resembles “bought”) are links in this Northern Cities chain shift. Specifically, they’re the components of the shift McCarthy hears most often in Chicagoans’ speech. If you’ve ever referred to your mom as “mahm” or searched for something in your gym “b-ea-g,” then you’ve taken part in the Northern Cities Shift, which is to say you’ve taken part in one of the most radical revisions of English pronunciation since The Great Vowel Shift of 1400. And it ain’t over. Say what you will about the homogenizing effects of national broadcast media (think how “standard” Tom Brokaw and Katie Couric sound); the truth is that Chicagoans’ vowels are getting more regional, not more standardized. Remember how the extreme raising of BAT set the stage for a wholesale reshuffling of Chicagoans’ vowels? It may take a few generations for conservative speakers and early-adopters to get on the same vowel wavelength. Right now we are mid-shuffle (translated into linguist-speak, the NCS is a “change in progress”). Some elements of the Chicago accent – the ones relating to early links in Northern Cities chain shift – have stabilized. BAT-raising and short “o” fronting might’ve been new-fangled innovations in the early half of the 20th century, but by 2012 most Chicagoans have cottoned on to the new vowel trend. Other aspects of the Chicago accent, though, are still up for grabs. Our children might pronounce “bit” the way we pronounce “bet.” They might pronounce “bet” the way we pronounce “but.” Or they might do something completely different. Linguistically speaking, these are exciting times. Is there an emerging Latino dialect in Chicago? To what extent are African-American and Hispanic Chicagoans taking part in these vowel shifts? What might a Chicagoan sound like a generation from now, or two generations from now? A good place to start is by finding out what Chicagoans sound like today. So, earlier this year we asked people to submit samples of their reading of "Too Hot for Hockey," a script custom-made by a linguist to test for elements of the Chicago accent. We&apos;ll be announcing our conclusions on that soon. their pals Dawn and Chad. They snacked on nachos, hot dogs, sausage, and pop. Then they noticed something odd: the gym was getting hot! Don and Dawn took off their jackets. Patty wiped the sweat with a paper towel. Chad took off his hat and used it as a fan. The puck never hit the ice, which sadly had begun to melt. They couldn’t get the gym cool enough. The match was canceled, so the friends headed to a bar to watch the Sox game.